Murray cod are our most iconic native freshwater fish and the good news is that their population is bouncing back thanks to record stocking, river restoration, tighter catch limits, more responsible angler practices and cracking down on illegal fishing. 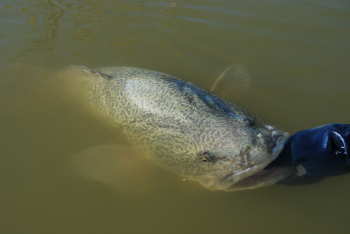 The slot limit, introduced in 2014, requires all Murray cod over 75cm and under 55cm to be released. For that to really work though, the released cod must live! That's where better handling practices come in. With help from an expert aquatic veterinarian, published science and practical advice from leading freshwater anglers, we've developed a 4 point plan to care for cod. Landing a big Murray cod, removing the hooks, photographing it, then reviving and releasing it, all requires careful planning and the right gear. Good organisation will ensure a quick release, minimise stress and maximise the cod's chances of surviving the encounter. Have your camera or GoPro ready and functions pre-set. A fish can't breathe out of water so they need water and time to recover. If possible, keep your cod in the water at all times. If safe to do so, get in the water with your prized fish for a great photo. 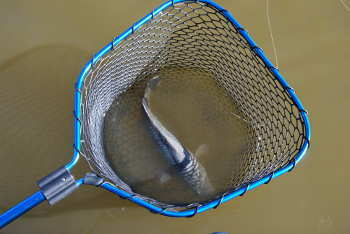 If you decide the lift the fish out of the water, do it gently and quickly and aim for 30 seconds or less air exposure. If lifting a cod, support the whole fish and don't hang the fish vertically, which can damage the spine and gills. Protect the skin by not placing the fish on dry, sharp or hot surfaces. Revive the fish slowly to get water flowing over the gills. Avoid moving the fish backwards and forwards. Be mindful that survival is lower in hot weather and warm, shallow water. A big cod on light line is more likely to get exhausted so use line classes and tackle that lands cod quickly and doesn't unnecessarily prolong the fight. 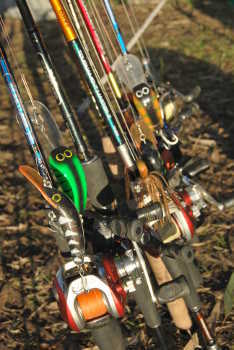 When fishing with bait, use large circle hooks (and a tight line) to reduce the chance of deep hooking. 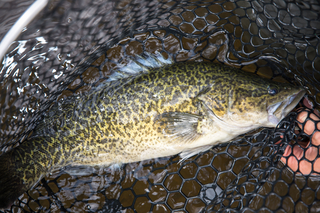 During springtime when Murray cod are on the nest, give them a rest and target other species like golden perch or redfin. While stocking programs help replenish cod populations, there is substantial breeding of wild cod in many waters that contribute to the fishery. Let them be during the three month closed season (except Lake Eildon, which is open year-round). Care for Cod merchandise is available in limited quantities at the following stockists.